Luxury House center Carvoeiro "Casa Isabella"
The house has a rustic, comfortable decor, house lighting is designed to relax. The house was completely refurbished, thinking about the well being of the client. 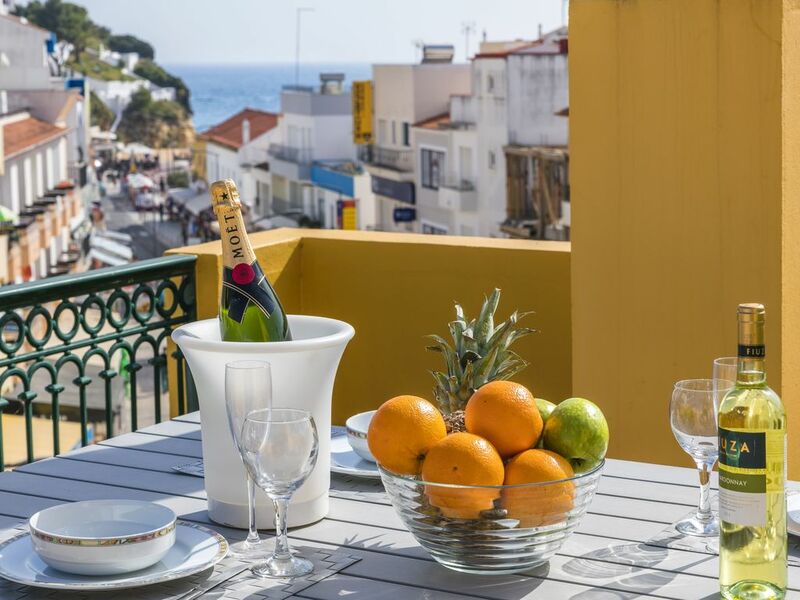 It has a balcony with fantastic sea view, where you can enjoy every minute of sun, sea, and tranquility in the center of the village of Carvoeiro. Nearby there are cafes, the best restaurants, supermarket, pharmacy, post office, bakery. The house is located 2 minutes from the Carvoeiro beach. We stayed at Isabella’s place for a week in February. The unit was very clean and all the beds were comfortable. Although we did not cook, the kitchen was well equipped. The bathrooms were clean and spacious with large showers. The roof top terrace was a great spot to sit and enjoy the sites and sounds of Carvoeira. Many restaurants to choose from - all with good food at reasonable prices. Particularly enjoyed Ele and Ela just down the street - highly recommend for quality and service! We would love to return soon! An apartment is situated on 2 floors, plus a terrace with an ocean view. First floor is like a living zone with contemporary design. Especially a big table is so amazing! Kitchen is fully equipped for all kind of food preparation. On the second floor there are located 3 double bedrooms. But only 2 equipped with air conditioning! Everything clean and very well maintained. Actually nothing negative to say. The beach is 5 minutes away. On the way to the beach one can find lots of nice shops, food shops, restaurants and ice-cream shops. The apartment was great and in a fantastic location! We loved the rooftop terrace, and the view, and spent many evenings up there. The apartment was clean, spacious and the beds, linen and towels all good quality. Great communication from owner and they we very accommodating with a last minute extra bed required. The only negative we have was that the 3rd bedroom did not have airconditioning! This was not mentioned in the description of the apartment, so we were led to believe all bedrooms had aircon. First class accommodation, great location! Isabella a lovely host, nice welcome and apartment was immaculate! Dieses Haus besteht aus zwei geräumigen Etagen und einer großen Dachterrasse. Die Ausstattung ist hochwertig und sehr geschmackvoll. Top-Lage mitten in der zentralen Fußgängerzone des Ortes. Von der Dachterrasse aus hat man einen Blick bis zum Meer. Ganz tolle Unterkunft, in die wir jederzeit zurückkehren würden. Sehr freundliche Vermieterin. Wir waren in den Pfingstferien dort, möglicherweise wird es in der Hauptsaison sehr trubelig im Ort.